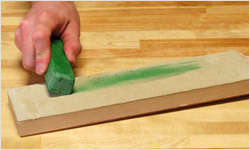 A strop is a surface that is used after the finest stone for the final stage of sharpening. The function of a strop is to polish the edge and work off any burr left behind by sharpening stones. 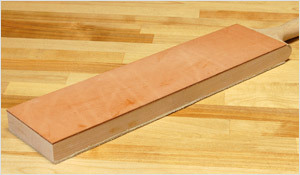 Although other materials are used, strops are most often made of leather. Both suede and smooth leathers, technically known as flesh side and grain side, are used. They can be mounted to a rigid base, like a leather on wood paddle strop, or can be flexible, like a leather and linen razor strop. Strops are frequently used with honing compounds, the extremely fine abrasives that give a mirror polish to an edge. 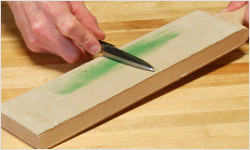 If you choose to use a compound, start by applying it to the surface of the strop. A little compound goes a long way, so there’s no need to cake it on. Hold the bevel against the surface of the strop with light pressure and move the blade away from the cutting edge. Turn the blade over and do the same on the other side. The process is the same on any stropping surface, with or without a honing compound. Never move the blade toward the cutting edge as it will cut into the strop, resulting in dulling of the edge and damage to the strop. A few strokes is usually sufficient. A strop is best used before you even think your edge is dull. Used consistently, it is a key step in maintaining a razor sharp edge. Do I need a compound? A strop can be used without any compound. 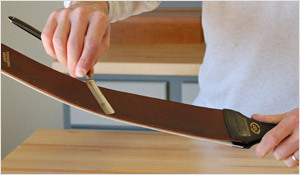 Sharpeners of straight razors for instance often prefer using a smooth leather strop with no compound applied. The leather polishes the metal and removes any burr from the edge, leaving it crisp and sharp. 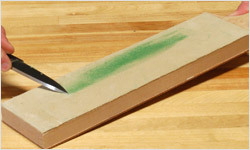 Knife and tools users on the other hand often use a compound on their strops. They find it quickly and easily gives them an excellent edge that meets their needs. In our experience, whether or not to use a compound is a matter of personal preference. Excellent results are achieved with either method, although honing compound with its abrasive particles will show results more quickly than plain. In the interest of being thorough many of us do both, using one strop with compound applied, then following up with a few strokes on a plain strop. Should I use suede or smooth? Leather strops come in both suede and smooth options. Some even have both on the same strop. Of course this leads many to wonder just which is the better option. While a common practice is to use suede in conjunction with compounds and smooth for plain stropping, this is by no means universal. We have found the decision to be a combination of personal choice and type of edge being sharpened. Straight razors are traditionally stropped on a smooth leather. The grain side surface is perfect for the delicate, low angle edges found on straight razors. 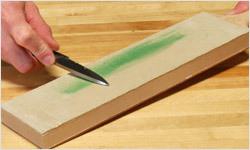 Many carvers and knife sharpeners use suede strops. The nap of the suede holds onto compound well allowing the strop to be loaded easily. The softer surface also provides a bit of rounding to the bevel as the suede compresses under the blade, which some find desirable. Those who don’t use as much or any compound may prefer the smooth grain side leather. Sharpeners of woodworking tools such as chisels where a rounding of the bevel is not wanted find that the slightly harder surface works to their advantage as well. We carry strops of many shapes and sizes with different combinations of surfaces. In general, they can be broken down into mounted strops and razor strops. Our mounted strops feature leather attached to solid maple. Depending on how you like to work and what edges you are honing, there are options to fit your needs, including bench mounted and hand held strops. All are available in suede or smooth. In the case of our popular and versatile Paddle Strops, one side is smooth and the other suede, giving both options in one. We carry razor strops that feature wide belts of high quality leather on one side and heavy linen on the other. Some straight razor shavers strop on the linen side first to clean the blade before moving to the leather for stropping. Others skip this step and whether or not to do it is a personal choice. Also known as hanging strops, they are hung from a fixed object like a wall, counter or barber chair for both storage and use. On one end of the strop is a hook and on the other a generously sized handle. Attach a sturdy anchor point like an eye bolt to a wall or counter, hang the strop by the hook from your anchor point and then grab the handle to pull it taut when using. The Illinois #127 is a generously sized, easy to use size and is a favorite for sharpening straight razors. For a comparison of all our available razor strops, see our article Comparing Razor Strops.